You guys, I am loving putting these together. It’s fun to try to find things that are just a little off the main radar (thus, you won’t see Mo Willems or No David! books on this list). Anyway, on to the picture books! More Life-Size Zoo by Teruyuki Komiya. I’ve mentioned Life-Size Zoo before and I like this second one even a little better – the lion in particular is extremely impressive. Perfect for any child that loves animals (watching Ella try to wrestle this enormous book amused me for days). Miss Nelson is Missing by Harry Allard and James Marshall. A lifetime favorite about a teacher who can’t control her wild class, so she dresses up as a horrible substitute teacher who scares the kids so much that they are complete angels by the time the real teacher returns (and boy are they glad to see her). There are three in this series, all just fantastic. Frankly, I love almost everything James Marshall does. Cowboy and Octopus by by Jon Scieszka and Lane Smith. Jon Scieszka and Lane Smith come out with such hilarious books and this is one of my favorites. In their usual style, it is as silly as can be, in just the way that many kids seem to love. When I read this aloud to my classes in Boston, the kids roared with laughter. You can’t help but feel good when you get a response like that. A Zeal of Zebras by Woop Studios. I almost categorically dislike alphabet books, but this one, oh I make an exception for. The cover is FAR more striking than this image makes it look and each page has a fabulous illustration of a group of animals. Each letter is dedicated to the name of a group of animals (An Aurora of polar bears, for instance, or an Embarrassment of Pandas) and then gives a little well-written paragraph or two about some interesting facet of that animal, whether it is their eating habits, habitat, endangered status, or migration patterns. This book is just FUN to look at. Chester by Melanie Watt. In the school I did my internship in, the librarian did a mock Caldecott and this one was the winner by a landslide. When I introduced it to my classes in Boston, it was equally popular. The author attempts to tell a story, but Chester, an enormous cat, keeps taking his red marker and making changes to the story that suit him. I like reading this one aloud in a very sedate voice when I’m the author and a loud, obnoxious voice when I’m the cat (and then making the author get increasingly irate and screechy as the cate gets out of control). The Pencil by Allan Ahlberg and Bruce Ingman. This story starts with a lone pencil that begins drawing a world full of people and objects. Of course, all the people and objects are grumpy, demanding that they get friends and food and, hey, it’s no fun being black and white – how about some color? The pencil is very obliging, dashing about and adding to the scenery and even drawing a paintbrush to fill everything in with color. But then, when he draws an eraser to fix a few things, the eraser gets out of control and starts erasing everything! Now it’s up the pencil to save the day. This book delights me every time – clever and fun and makes me want to draw (and then I remember that my artistic skills rank so low there isn’t a scale). Free Fall by David Wiesner. I adore David Wiesner – his work is really what made me fall in love with picture books. This wordless one is a favorite of mine. As a little boy drifts to sleep, you see his dreams change from one scene to another, much of it drawn from objects in his own bedroom (his checked quilt, for instance, becomes a life-size chess board). You can just lose yourself in the amazing details of this one. 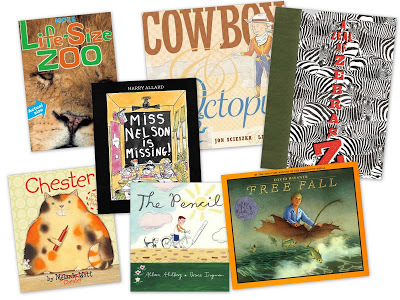 You can see other picture books I’ve loved and reviewed. Any suggestions to add? Chowder by Peter Brown. The Fabulous Bouncing Chowder is not as good as the original, but my daughter still giggled herself silly at it. We love Cowboy & Octopus and Chester too! I will have to check out the others soon. Some of our recent favorite picture books include Children Make Terrible Pets by Peter Brown, Monsters Eat Whiny Children by Bruce Eric Kaplan, and Betty Bunny Loves Chocolate Cake by Michael Kaplan. I grew up with the Miss Nelson books and they are amazing!! I loved reading them as a kid, and still do. How about a special request for YA romances? Hmm?? I want those zoo ones, but buying isn't in the cards and my library doesn't have them. Boo. I remember Miss Nelson! Those really were awesome books. "Hippo! No, Rhino" by Jeff Newman is a favorite over here. I will have to check these out. The only one I know is Mrs. Nelson Is Missing. I recently found out about this blog through my friend Jenna and I just have to say that I LOVE that you're doing the Gift Guide for children's books! I've been looking at reviews on places like Amazon and there are just too many books to pick from. I'm so glad you put Miss Nelson Is Missing on this list! My maiden name is Nelson and I always loved that book as a kid. =). I'll have to check out these other ones. Picture books make such great gifts for nieces and nephews. We currently have the More Life Size Zoo checked out of the library. The lion page is the bane of my existence. It folds out sort of funny (not really intuitive for young children) so of course it is ripped, which draws Finn attention to it even more….which mean some added rippage, etc. But he absolutely loves it. Sigh.